Before you bring your new cat home it is important to spend some time kitten proofing to ensure the house is safe for your new addition. One useful way to visualise potential hazards is to look at your house from your cat’s level. Bear in mind that kittens are adept climbers and jumpers, and are quite capable of accessing areas several feet from the ground. Ensure all power and telephone cords are out of reach to your cat. Power cords can be quite attractive to chew on so it is important to keep them out of the way. If you are still having difficulty keeping your cat away from the power cords you can try painting them with a deterrent such as bitter apple. This will taste revolting to your kitten but isn’t poisonous. There are many species of plants which are toxic to cats so keep houseplants out of reach. Keep all ribbons, ties, elastic bands out of reach. If you enjoy sewing make sure your needles are stored away properly. Candles and oil burners can easily be knocked over by a kitten and be a potential fire hazard and severely scald/burn your cat. Keep well out of your kitten’s reach. Keep all cleaning chemicals and laundry detergents in a secured cupboard. Both of which are a common cause of poisoning in cats. Be careful with your kitchen waste. It is possible for your cat to become very sick as a result of eating scavenged food. Ensure the washing machine and tumble dryer doors are closed at all times. Don’t leave food lying around. There are some foods (chocolate and onion to name a few) which are toxic to cats. Also be mindful of food wrappers such as cling film and aluminium foil which could be swallowed. Don’t allow your kitten to play with toothpicks. Keep safely in a drawer. Be careful with unattended hotplates. When not in use cover them with a hotplate guard. Keep all bathroom cleaners in a cupboard, preferably a locked one. Ensure the toilet seat is down at all times. Many kittens have drowned after jumping into the toilet. Keep medicines in a medicine cabinet and out of reach of your kitten. Young children, in particular, can sometimes be rough on cats, especially kittens. Ensure your child is supervised around the cat. There are lots of hazardous chemicals stored in garages. Keep these in a safe, out of reach place. Properly secure heavy gardening equipment and tools you may have stored in your garage. Clean the floor of any hazards such as anti-freeze and oil which may have leaked from your car. 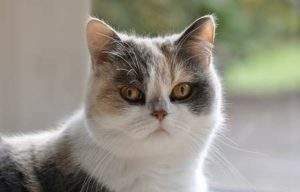 Indoors (with access to an outdoor enclosure) is always preferable, however, many pet owners still do permit their cat to have access to the garden. Once again, there are many plants which are toxic to cats. Be careful that your cat doesn’t have access to these plants. Snail pellets/slug bait can be fatal to cats, so don’t use this in areas your cat can access. Be mindful of weed killers and avoid using where your cat wanders/sleeps. Look for small parts which can easily be chewed off and swallowed when buying cat toys. Kittens, in particular, can and will put anything in their mouths, including linear objects such as string. This can cause telescoping of the intestines, a life-threatening disorder in which the intestines fold in on themselves. Blinds with cords can be a choking hazard, tie them high enough so a kitten or cat can’t reach them. Keep windows closed, if this is not possible install a mesh screen to prevent your cat escaping or falling from a height. Keep cupboard and drawers closed at all times. Cats, but especially kittens are inquisitive creatures and may jump in and either be trapped or injured when somebody closes the drawer/door. Block off any small areas/nooks and crannies your cat may be able to crawl into. Carefully check any toys your cat has access to. These include both cat toys and human toys which may be lying around. Ensure they are safe with no loose parts or strings your cat could chew off and choke on.